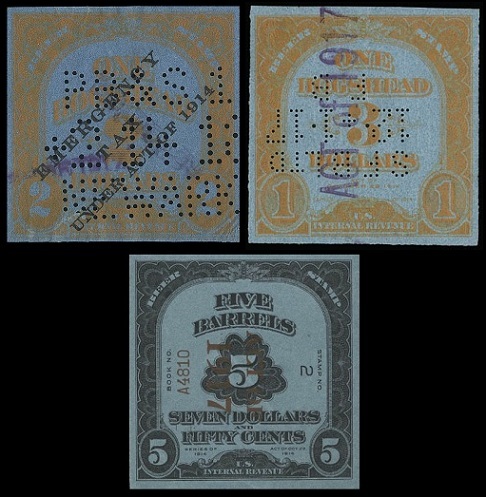 Federal beer tax US revenue stamps witnessed a complex array of provisional issues during 1917 and 1918, with the advent of more tax changes and the US entry into World War I. The federal beer tax rates were $3.00 per barrel in 1917 and $6.00 per barrel in 1918, with a standard barrel containing approximately 31.5 gallons of beer. Beer tax stamps were provided to brewers in imperforate sheets. After filling the barrel, the brewer would then cut out the appropriate stamp for the particular sized barrel being shipped to the consumer. The stamp was to be placed over the bung (stopper or cork) of the barrel and then canceled. When the barrel was opened by the consumer, the stamp would usually be punched-through or otherwise mutilated, with the end-result being the prevention of the stamp's reuse. Quite a few of these stamps must have been more carefully removed though, as many undamaged, very nicely canceled examples are available in the philatelic marketplace. The images used on these beer stamp pages are NOT SIZED TO SCALE. Most of the beer stamps measure approximately 2 3/4 inches in width by 2 3/4 inches in height. The images have been re-sized so that more of them can be displayed in this webpage format. 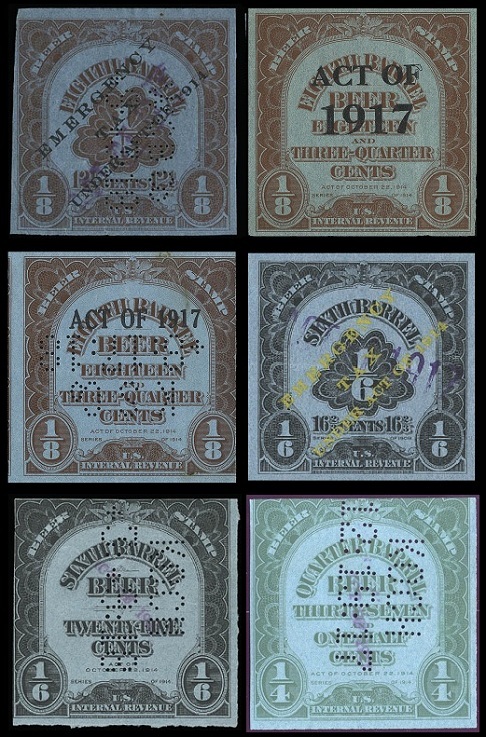 The major-type beer tax stamps of 1914-1916 were provisionally surcharged in 1917. The tax rate was increased to $3.00 per barrel. 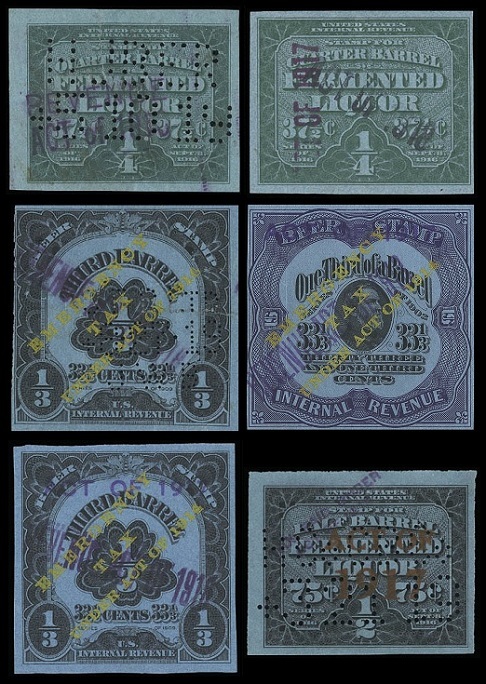 The group of 1917 surcharged beer tax US revenue stamps shown above are samples of the various surcharge types. The varieties that are shown above, as well as those that are not shown, will be notated in the catalog details table below. There are three major types of the surcharges, though numerous variants of all of them exist. 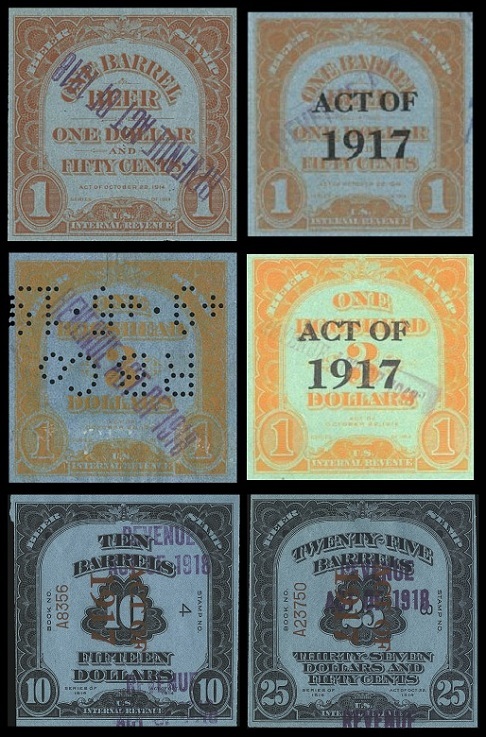 Type A -- "ACT OF 1917" hand-stamped in 1-3 lines, with more than 30 different styles. Type B -- "ACT OF 1917" locally printed horizontally in black or red. Type C -- "ACT OF 1917" printed horizontally or vertically by the Bureau of Engraving and Printing in black or red. (37 1/2 C.) on #REA096 (1917 - Type A - Sc. #REA117) - Shown. (37 1/2 C.) on #REA106 (1917 - Type A - Sc. #REA118) - Not shown. (37 1/2 C.) on #REA106 (1917 - Type B - Sc. #REA118b) - Shown. (37 1/2 C.) on #REA106 (1917 - Type C - Sc. #REA118c) - Shown. (50 C.) on #REA097 (1917 - Type A - Sc. #REA119) - Shown. (50 C.) on #REA107 (1917 - Type A - Sc. #REA120) - Shown. (75 C.) on #REA108 (1917 - Type A - Sc. #REA121) - Shown. (75 C.) on #REA115 (1917 - Type A - Sc. #REA122) - Shown. (75 C.) on #REA115 (1917 - Type B - Sc. #REA122b) - Not shown. (75 C.) on #REA115 (1917 - Type C - Sc. #REA122c) - Shown. (01.00 D.) on #REA099 (1917 - Type A - Sc. #REA123) - Shown. (01.50 D.) on #REA116 (1917 - Type A - Sc. #REA124) - Not shown. (01.50 D.) on #REA116 (1917 - Type B - Sc. #REA124b) - Not shown. (01.50 D.) on #REA116 (1917 - Type C - Sc. #REA124c) - Shown. (03.00 D.) on #REA110 (1917 - Type A - Sc. #REA125) - Not shown. (03.00 D.) on #REA110 (1917 - Type C - Sc. #REA125c) - Not shown. (06.00 D.) on #REA102 (1917 - Type A - Sc. #REA126) - Shown. (06.00 D.) on #REA111 (1917 - Type A - Sc. #REA127) - Shown. (15.00 D.) on #REA103 (1917 - Type A - Sc. #REA128) - Not Shown. (15.00 D.) on #REA129 (1917 - Type C - Sc. #REA129) - Shown. (30.00 D.) on #REA113 (1917 - Type A - Sc. #REA130) - Not shown. (30.00 D.) on #REA113 (1917 - Type C - Sc. #REA130c) - Not shown. (75.00 D.) on #REA114 (1917 - Type A - Sc. #REA131) - Not Shown. (75.00 D.) on #REA114 (1917 - Type C - Sc. #REA131c) - Not Shown. 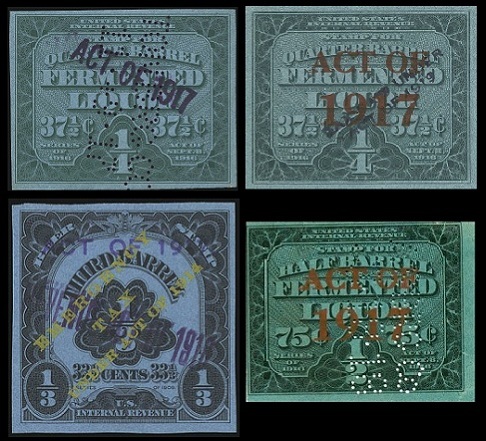 The major-type beer tax stamps of 1914-1917 were provisionally surcharged "ACT OF 1918" or "REVENUE ACT OF 1918" with rubber stamps in various colors in 1918. The tax rate was increased to $6.00 per barrel. Surcharges dated 1919 are erroneous. 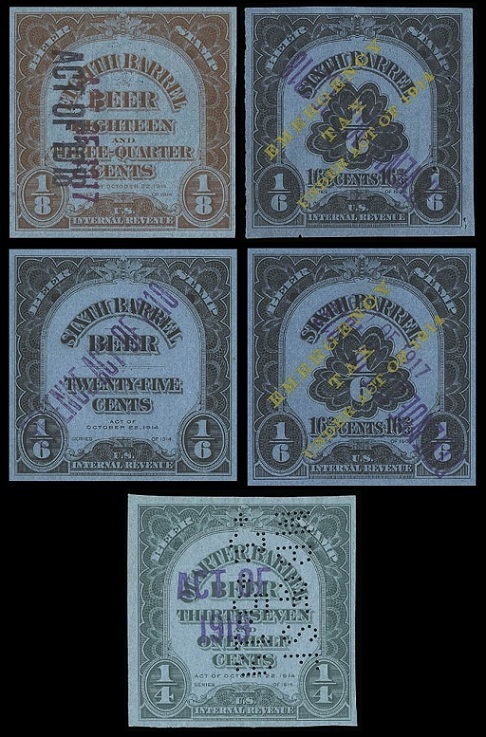 The group of 1918 surcharged beer tax US revenue stamps shown above are samples of the various rubber stamp surcharge types. The varieties that are shown above, as well as those that are not shown, will be notated in the catalog details table below. (75 C.) on #REA118 (1918 - Sc. #REA132) - Shown. (01.00 D.) on #REA097 (1918 - Sc. #REA133) - Shown. (01.00 D.) on #REA107 (1918 - Sc. #REA134) - Shown. (01.00 D.) on #REA119 (1918 - Sc. #REA135) - Shown. (01.00 D.) on #REA120 (1918 - Sc. #REA136) - Not shown. (01.50 D.) on #REA108 (1918 - Sc. #REA137) - Shown. (01.50 D.) on #REA115 (1918 - Sc. #REA138) - Shown. (01.50 D.) on #REA122c (1918 - Sc. #REA139) - Not shown. (01.50 D.) on #REA122 (1918 - Sc. #REA139b) - Shown. (02.00 D.) on #REA099 (1918 - Sc. #REA140) - Shown. (02.00 D.) on #REA099a (1918 - Sc. #REA141) - Shown. (02.00 D.) on #REA123 (1918 - Sc. #REA142) - Shown. (03.00 D.) on #REA124c (1918 - Sc. #REA143) - Shown. (06.00 D.) on #REA110 (1918 - Sc. #REA144) - Shown. (06.00 D.) on #REA125c (1918 - Sc. #REA145) - Shown. (12.00 D.) on #REA111 (1918 - Sc. #REA146) - Shown. (12.00 D.) on #REA111 (1918 - Sc. #REA147) - Shown. (30.00 D.) on #REA112 (1918 - Sc. #REA148) - Not shown. (60.00 D.) on #REA113 (1918 - Sc. #REA149) - Not shown. (60.00 D.) on #REA130c (1918 - Sc. #REA150) - Shown. (150.00 D.) on #REA131c (1918 - Sc. #REA151) - Shown. The Eighteenth Amendment of the US Constitution was ratified on January 16, 1919, and it took effect on January 17, 1920. The new constitutional law established the prohibition of the manufacture and consumption of alcoholic beverages in the United States of America. The Prohibition Era had begun, and beer tax stamps were no longer needed. The Scott catalog listings for the provisional surcharges of 1917 to 1918 are very confusing. Quite a few of the surcharge varieties are tremendously expensive, and great care should be used when purchasing any of them. The use of specialized reference books in collecting these issues is strongly recommended. The definitive reference book on beer tax US revenue stamps is "United States Beer Stamps", by Thomas W. Priester. This reference book, along with the Scott Specialized Catalog of United States Stamps, is an absolute necessity for anyone wishing to specialize in US beer stamps.